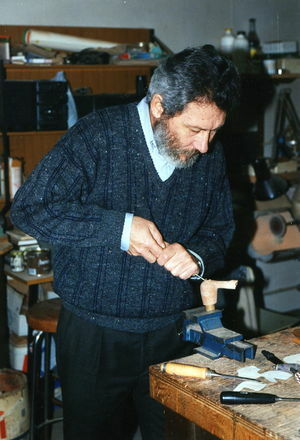 "Impatience launched Claudio Cavicchi's pipemaking career. He ordered a Caminetto Oom Paul through a local tobacconist, and waited. Then he waited some more. After months had passed and no pipe arrived, he decided he'd waited long enough and made one himself. It turned out great. 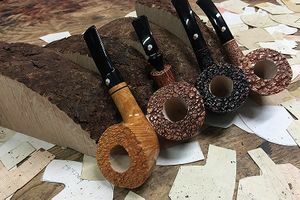 He had located a single block of briar and a clear acrylic mouthpiece, and he turned them into an Oom Paul that looked precisely like the Caminetto he wanted. He's been a pipemaker ever since. His background was in farming, so it's unsurprising that he would rely on his own skills in that situation. Farmers can make anything. 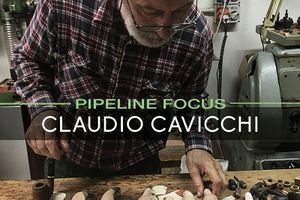 However, it takes an artistic personality to achieve pipemaking success, and Cavicchi has that, too. When he retired after 30 years of farming, he took up pipemaking fulltime and reduced his output significantly. 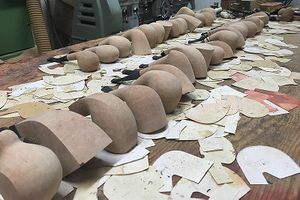 One might think that the extra time would result in more pipes, but the opposite was true, because he started spending more time on each individual piece. 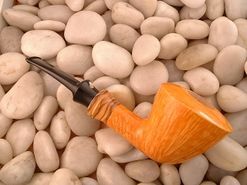 What Cavicchi is perhaps best known for is the excellent grain of his pipes. He can read briar as though it were a printed page. Maybe his years of farming the land gave him insight into natural elements, but he also takes extra steps to acquire the best-grained briar possible. He does not buy large shipments but prefers purchasing briar regularly, six times a year, so that he has access to fresh batches and can choose the very best on every trip. When choosing briar, he takes his time, examining each individual block for the grain necessary to complete a particular shape. This is the magical part of the process. Cavicchi seems able to gaze into the briar and foresee exactly what it offers, hence his high percentage of smooth, straight-grained pipes. 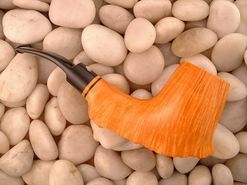 However he does it, he crafts pipes that have stunning grain, and he achieves approximately 80-90 percent smooth pipes. Once he gets the briar home, they go into a special room for two years to cure before becoming pipes. 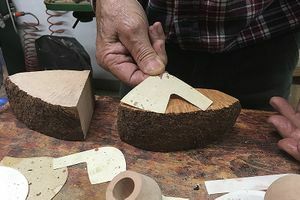 Billiards, he says, are difficult shapes for grain, as are Bulldogs (and other traditional shapes), because the specifications and requirements for the shapes are antithetical to natural briar grain. The grain fans out from the center of the briar burl, so finding consistently oriented grain for multiple parallel surfaces is a challenge. Not only can he make pipes, but Cavicchi is a world champion pipesmoker as well. His first slow-smoking competition was in 1982. If you're unfamiliar with smoking contests, the goal is to keep three grams of tobacco lit for as long as possible, with only two matches to use at the start. Cavicchi won the Italian competitions in 1983, 1985, and 1988, and won the World Championship in 1989, 1991 and 1993. With that 1993 win, he kept his pipe going for 3 hours, 9 minutes and 3 seconds. This is a craftsman who knows pipes from many perspectives. He knows what makes a pipe smoke well and what makes a pipe look beautiful. He knows how to charm the briar to his bidding. His pipes are graded with the symbol ©, with increasing numbers of them up to five ©s for higher grades, and the Diamonte stamp representing the very pinnacle of his pipes. Very few pipes have emerged from his workshop with the Diamonte stamp, fewer than 100 in the 40+ years he's been carving pipes. All Cavicchi pipes have acrylic stems, his preference because they do not oxidize. Cavicchi says it took about 15 years for his pipes to enter the mainstream. He regrets not a day of it, but it took a long time before becoming accepted as an upper-tier manufacturer. He just kept honing his skills and developing new shapes until people took notice. At this point in history, they have taken notice for sure. Cavicchi pipes are admired everywhere for their shaping, finish, grain, smoking qualities and accessible prices, all coming from a little farmstead outside of Bologna, Italy, where Claudio Cavicchi learned the fine art of rendering natural materials into useful and beautiful objects for daily use."